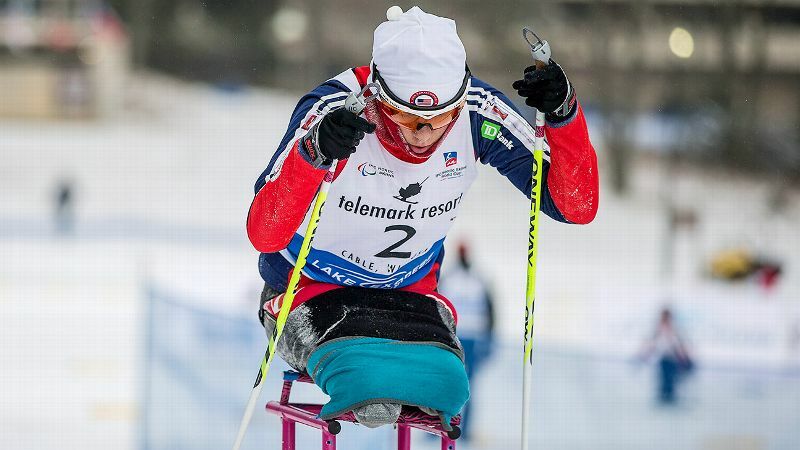 Though she's only been training for para-skiing for a year, Oksana Masters won bronze medals in two World Cups in the sit-ski cross-country competition, and came in first the U.S. Paralympic Cross Country National Championships. Some people would take time off after winning an Olympic medal. Oksana Masters went para-skiing, and quickly found her next Olympic sport. Masters won bronze in rowing at the London Paralympic Games in 2012 - a year in which she also was named the first adaptive athlete to win the USA Rowing's Female Athlete of the Year award and appeared in ESPN The Magazine's The Body Issue. She tried para-skiing for the first time that November, and went on to qualify for the U.S. 2014 Paralympic team 14 months after learning how to ski. She'll be among the competitors when the Games open Friday in Sochi. Born in Ukraine, Masters became a bilateral above-the-knee amputee as a result of radiation exposure that caused severe birth defects. She was adopted from an orphanage by an American woman at age 7 and made snowy Buffalo, N.Y., her home. The family settled in Louisville, Ky., a few years later, where Masters pursued rowing. Though she's been training in para-skiing for only a year (and not even full-time at that), Masters, 24, won bronze medals in two World Cups in the sit-ski cross-country competition, and came in first at the U.S. Paralympic Cross Country Championships in biathlon, a sport that combines skiing and target shooting. Most of her time last spring and summer was spent training with her rowing partner, Rob Jones, for the 2013 World Rowing Championships in South Korea. Masters won bronze in rowing at the London Paralympic Games in 2012. "When I'm rowing, I focus on that main sport," she said. "So for South Korea, I did nothing but focus on rowing. Once I got to Colorado [where she recently moved to train], I only focused on skiing. For me, concentrating on the task at hand works best." Since she was able to maintain upper-body strength for both sports throughout the year, Masters had to amp up her endurance training, as skiing distance competitions range from 800m to 12.5K and she could be out on the snow during a competition or training -- in frigid temperatures -- up to three hours at a time. Competing in the Winter Paralympics never seriously crossed Masters' mind until she met Paralympic Nordic ski coach Eileen Carey at a CrossFit event where she and her partner were demonstrating how to adapt rowing machines for athletes with special needs. After hearing about Masters' love of snow and interest in downhill skiing, Carey helped make it possible for Masters to go out to a ski event in Breckenridge, Colo. Although she thought she was going to try downhill skiing, the coaches put her in sit-ski, a cross-country-type event. "There was a big learning curve and a lot of falling down when I first learned para-skiing, since I didn't know how to control the SkiErg," Masters said. "Coming from a sprinting background, I would start out with a lot of power, go hard for 100 or 200 meters and then fall over because I didn't know how to handle the snow, turns or what to do in certain situations." There's still a lot to learn when it comes to finesse, technique and understanding that falling down during competition is still quite likely to happen, Masters said. "Since I know that I fall often, it's been important for me to learn how to get up really fast, keep my momentum going and not let that get to me." Even though Masters qualified for all three cross-country skiing events and all three biathlon events, she said her coaches will determine which events she'll compete in during the Games, depending on where they think she'll have the best opportunity to earn a medal. And though she has been a speedy success story in cross-country skiing, Masters says she loves the shooting part of the biathlon competition, especially when she makes the shots. "The learning curve is much harder than cross-country skiing," she said. "It requires more technical skill, like learning how to bring your heart rate down in order to shoot." While a medal "would be awesome," Masters said she's being realistic with herself and her goals based on the time and training she was able to put into the sport and the fact that she'll be competing with the world's best in her category. She's aiming to place in the top 5 or 10 in her event. "Skiing has definitely helped me in rowing," she said. "As an athlete, I think I can learn and grow so much more by doing different sports. With every new sport you learn something new that you can still apply to your main sport or whatever your main focus is. I can transition a lot of things from rowing into skiing and vice versa, and I'm excited to see what the next few years bring me for both sports."